A guide to obtaining credits under the Code for Sustainable Homes. What is the Code for Sustainable Homes (CSH)? The Code for Sustainable Homes provides a comprehensive measure of the sustainability of new homes, ensuring that sustainable homes deliver real improvements in key areas such as carbon dioxide emissions and water use. It has been developed to become the single national standard for the design and construction of sustainable homes, and that it drives improvements in home building practice. Credits are gained by the housebuilder for various features incorporated into the design, these include Energy and CO2 Emission limitations, Water Management, Building Materials used, Surface Water Run-off, Waste Management, Pollution Control and Health and Wellbeing. What is a Sustainable Homes Credit? The Code covers nine categories of sustainable home design, with credits awarded for each requirement achieved in that category, except in the six mandatory categories where minimum performance standards must be achieved, which have no associated credits. The total number of credits available to a category is the sum of credits available for all the requirements within it. How many credits can cycle storage obtain? Secure cycle storage gains points under the Health and Wellbeing category of the Code, which aims to ‘encourage the wider use of bicycles as transport by providing adequate and secure cycle storage facilities, thus reducing the need for short car journeys’. How can Trimetals products help? Trimetals’ Protect a Cycle store and the CSH 950, CSH 960, CSH 680 and CSH 108 Titan sheds are all suitable for the secure storage of cycles that meets the Code’s criteria, so by incorporating the Protect a Cycle or a Titan CSH shed in your project, you can gain valuable credits. The Protect a Cycle can store one cycle under the Code, earning up to two credits, depending on the size of the dwelling. 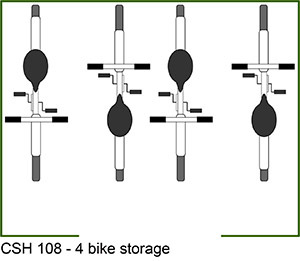 The Titan CSH 950, CSH 960 and CSH 680 can store two cycles and the CSH 108 can store up to four cycles – therefore up to two credits can be achieved for all the CSH sheds. Do these products fully comply with the criteria? Yes, both the Protect a Cycle and the Titan CSH range were designed to comply with the requirements of the code. For example, to conform, the store must be securely fixed down to a concrete foundation, and the Protect a Cycle and the Titan CSH range are supplied with fixings for this purpose. All models meet or exceed the minimum storage area required to store cycles on the floor, which includes space to allow cycles to be moved independently of one another. In addition the Titan CSH range also conforms to the additional space requirement for garden tool storage (one square metre). 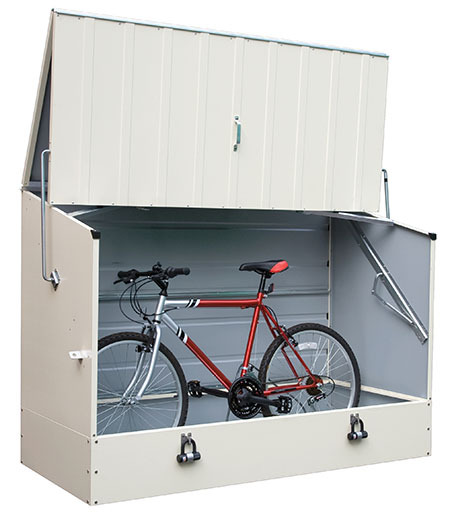 The Protect a Cycle is a unique high security metal bicycle storage unit. It is an ideal product to incorporate into a sustainable housing project as it is the only bicycle storage solution which has been tested and approved by both the Loss Prevention Certification Board and Secured By Design (Police Preferred Specification). External containers specifically designed for the secure storage of bicycles must be certified to LPS 1175 SR1. Locks: The Protect a Cycle features both external padlocks and Secure Internal Fixings comprising of a ground anchor and Loss Prevention Board tested cable and lock (for securing the wheel and frame) – the CSH sheds feature a stainless steel hasp and staple coach bolted through the door and secured with the Sold Secure Silver rated padlock – they also feature a Sold Secure Silver rated internal ground anchor. The Protect a Cycle is approved to LPS 1175 SR1 and all CSH sheds meet or exceed the stated security requirements – the Protect a Cycle is classed as a Proprietary Product so the internal space is flexible, the sheds also conform to the space requirements (a minimum of 2m long and 1.5m wide for two cycles and 2.5m wide for four cycles) which is needed to move cycles independently of each other and also allow for one metre square of garden tool storage. Please visit the government’s Code for Sustainable Homes page for further information on the Code’s requirements.